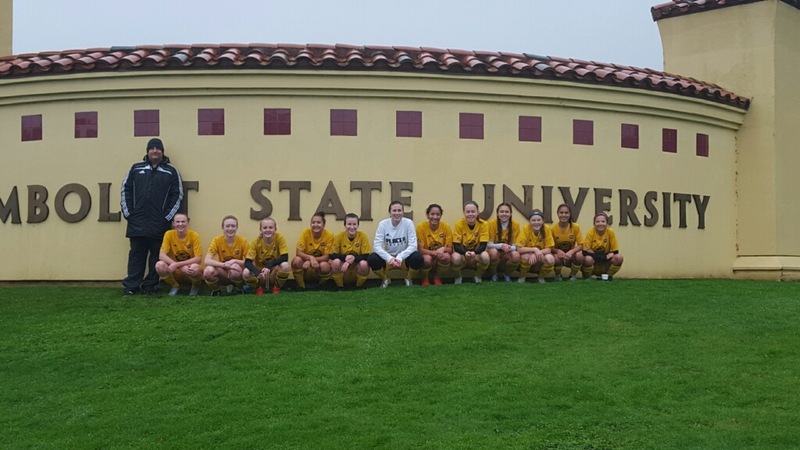 January 16-17, 2016 — “We went on a very fun trip this past weekend up to Humboldt State University in Arcata,” said Todd DeCarlo, coach of the Placer United U16G Black team. The players and families arrived Saturday and met down on the College Creek Soccer Field for a tour of the campus and athletic facilities with the HSU coaching staff. The Saturday visit concluded with a candid classroom question and answer session. On Sunday, the girls braved the rain and played a double-header versus the local AC Somoa team. Placer set up a mock college experience by meeting in the exclusive, soccer program only locker-room for the pre-game, halftime, and post-game. The girls enjoyed playing two very nice soccer games over the weekend, despite having low numbers due to illnesses and injuries and only one sub. Placer took game one in the morning 2-0. Then, working very hard in the final 30-minutes of game two, the girls stepped on the pedal for three goals to finish up with a 5-0 afternoon victory. The two victories certainly made the ride home a bit easier. 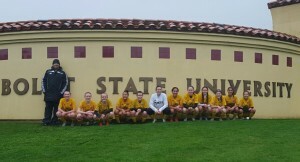 The team took a final photo just outside the gate to finish up the weekend and Placer hit the road for home.